Befitting of the calendar change, a weather pattern swap will occur on this first day of March. Behind showers, out go above average temperatures and in comes sunshine and seasonable temps. Looking back at February 2018, it was the warmest on record. With a monthly average temperature of 65 degrees, it barely beat out 1932 and 2017. There was a record nine straight days of 80 degree-plus temperatures from February 14 – 22. Additionally, there were a total of 11 days above 80 degrees, the second highest total for the month to the 12 in 2017. Today and Tonight: A cold front will move into the region on Thursday bringing scattered showers to the Baton Rouge area, mainly between 10am – 3pm. This weakening front likely will not even produce much in the way of thunder and some locations could even miss rain. Temperatures will make it into the mid 70s before leveling off once the front passes. Winds will shift northerly overnight as skies clear and lows fall into the low 50s behind the front. Up Next: On the other side of this boundary, look for the coolest readings thermometers have seen in a few weeks, especially with regard to morning lows. Some 40s are possible Friday and Saturday mornings. Afternoon highs will be close to normal in the low 70s with sunny afternoons. At least two nice outdoor days are anticipated, but the latest trends suggest that we may squeeze out a third on Sunday before unsettled weather returns early next week. For the first time this season, the LSU Baseball Team will host a weekend series that has virtually no threat of rain. 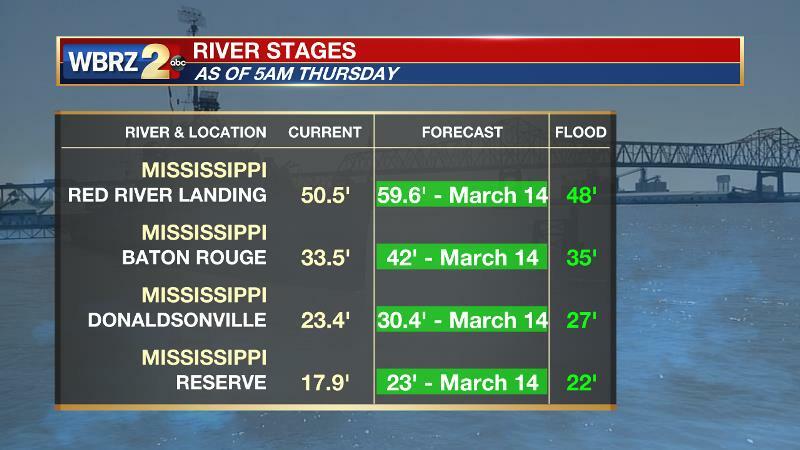 The Mississippi River at Baton Rouge is slowly rising in response to heavy rain in the Midwest and Ohio Valley over the last few weeks. At Baton Rouge, a crest 6 to 7 feet above flood stage is expected in the next two weeks. Given the current forecast, river traffic and industrial operations would be affected; however, the city of Baton Rouge is protected by the levees. River islands and some inland areas north of the city, such as farmland near Angola, will experience some inundation. A cold front will move into the region on Thursday. While a decent line of showers and thunderstorms will accompany the front into north Louisiana and Mississippi, the associated shortwave trough is expected to begin shearing out as the basin positons north of our area. In addition, the cold front will move beneath an upper ridge to our south and will slow and weaken as it approaches the Gulf of Mexico. For this reason, thunderstorms and widespread, heavy rain look unlikely. While it previously appeared the action would come quickly on Thursday, the southward progression of the boundary and the precipitation may be rather slow, taking most of the day to pass. On the other side of this front, the Baton Rouge area is likely to enjoy a stretch of sunshine and more seasonable temperatures. By this weekend, lows could dip all the way into the 40s, marking the coolest temperatures since mid-February. Another ridge will briefly build over the area on Saturday afternoon allowing slightly above average readings Sunday. Yet again, a retreating front will come north on Monday returning showers and thunderstorms to the forecast. A cold front to follow on Tuesday could bring some rounds of moderate to heavy rain. In the long-term, near to slightly below average temperatures are expected into early March.